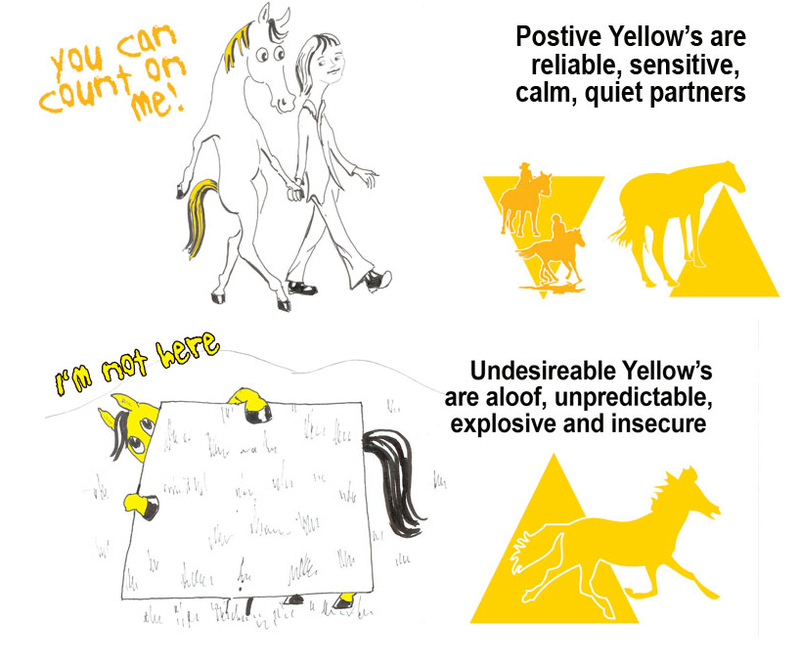 The Yellow Horse – The Yellow horse is one of the most challenging horses to own, train and read. They internalize their feelings and emotions until they all boil over and then everyone knows about it. They care a great deal about their relationship with you, even if they don’t show it. Trust, comfort and safety are what motivate this horse. They are very sensitive but can also be bossy and aloof. If your timing is out then they can go from being super quiet to explosive in milliseconds, causing you to feel very insecure. Once you have the trust and a solid relationship with this horse they are truly amazing, very reliable, calm and super responsive. Move, Reserved, Defensive, Explosive, Robotic, Solitary, Unreliable, Hide at the back of the Herd. if you push too hard. So take your time, be patient, but be firm and have a strong image of the outcome you want to achieve. They make excellent horses for Western Pleasure, Camp Drafting, Cattle Mustering and Trail Riding. Perfect Owner: This horse requires someone who always puts the relationship first and takes their time, is very patient and is not in a hurry to achieve outcomes. Once you have the relationship established with this horse they will be very reliable. Because these horses don’t share their feelings and are not that people oriented they require an understanding person that appreciates how they operate as it can feel like there is not a lot of love coming back at you. and tend to internalize their feelings. They don’t crave recognition, placing more importance on relationships. They are caring and sensitive souls that often take a holistic approach to life. The yellows like to think and reflect a lot and tend to indulge in over thinking, worrying and catastrophizing. This can cause them to become fearful, anxious and reluctant to assert themselves when need be. The buildup of too much thinking and emotions can cause a Yellow person to have a melt down or even freak out unexpectedly. Thinking and feeling so much, Yellows are often good at problem solving and achieving great things. Spontaneous, Quiet Achiever, Holistic, Spiritual. Unfocussed, Over Protective, Distracted, Day Dreamer, obsessive, Impulsive, Cautious, Emotional. You and your horse may fall into one or more colours, this is quite normal. However, there tends to be one colour that seems to be more dominant than the others. This is the same for humans as well. The Decoder is designed so that you can determine how extreme your horse’s personality is. The Horse Decoder is designed so that you place a “DOT” in the small blank square where you notice behavioural traits of your horse, you can then determine whether your horse displays that behavior, sometimes, often or all the time. You can then see where your horse may need assistance. The more colours and the more extreme the negative traits, the more difficult the horse will be. The Horse Owner Decoder is a little different it works on our basic self and high self. Again, you need to place a “DOT” in the blank square if you notice traits that you are known to display around horses. It’s often best to have someone else fill this in with you. You can then see how you maybe impacting your horse and can work towards improving your skills and behaviour around your horse. Horses and people can change personalities depending on the situation, environment and other people/horses they are surrounded by. The Horse Owner Decoder is about the personality traits you demonstrate around horses. For example, you maybe a Blue in the office, a Yellow around horses and a Red in front of the In‐laws!! !The Horse Owner Decoder has been designed to help you understand how your personality around horses rubs off on the horse. If you engage in more awareness around your horse, you will be more congruent and create a more open, authentic flow of energy and understanding between you and your horse. If you bring your basic self into the relationship, you will be putting all of your hang‐ups first, which is what the horse will read and mirror. Most people are not even aware of their negative energy, emotional blocks, child hood traumas and daily issues to understand that this is actually impacting the horse’s behaviour and their own wellbeing. Because horses are prey animals, they have a “heightened sense of awareness” or as we know it in humans “extra sensory perception” (ESP). Horses read energy, energy fields, emotions, feelings and body language at a level that most people are not aware of or in tune with. This is often an area that is labeled as “a heap of crock” or “hoodoo voodoo”. Horses communicate with each other and learn through images, body language and emotions, they transfer images telepathically to the herd and their paddock pals and also to humans who are on a frequency to receive it. Many people around the world are receiving these images, messages and feelings from horses with incredible accuracy. What most people are not aware of is that the thoughts, words, images, feelings and emotions they are projecting at a subconscious level are actually being received by their horse. There is plenty of research available and substantial evidence from people who work at this level with horses to prove its existence. A very good book to read that explains this in more depth is “Linda Kohanov’s, Riding Between the Worlds”. Identifying horse’s personalities can sometimes be a bit tricky, especially if there are multiple extreme traits. Horses I believe are born with a pure, innate personality that takes shape from their environment and handling. The horse’s personality will be shaped by many things included the position it’s mother was in the herd, the birth order in the herd, eg, was it the first, third or last foal of the season. Did it run in a herd or only with mum or a few others? What is the personality of the Dam and Sire? What is the personality of the Grand Dam and Grand Sire etc? All of these things impact the Herd. Often the last born foal of the season can end up being defensive as it is pushed around by the other foals and dominated. First borns are often very confident as they are the ones who start the dominating. Foals from Alpha mares are usually very confident, whilst foals from mares lower down on the pecking order learn to tow the line. Most importantly though is how well the horse has been handled by humans. Horse’s are perfect until we bring humans into the equation. Like us they can be confident in the paddock with their paddock pals, but when we change their environment, interact with them in a language they find difficult to understand, they become stressed and dysfunctional a lot like humans do when they are put in stressful situations, yet we often blame them, punish them, yell at them and demand that they behave, which of course doesn’t work! If only we could see life from their perspective? Another observation that we have made is that horses can be one colour personality on off side and another on the near side. For example, the horse may have been born Red, but with inappropriate handling on both sides can end up for example a Red on the off side and a Purple on the Near side. We have seen this happen as both sides were not workedevenly or with time and feel. The horse demonstrates a blocked, stubborn, resistant personality on the near side and is forward, panicky and hypersensitive on the off side. It was interesting to diagnose this, but it made perfect sense once we worked it out. The left and right side of the horse’s brain are not joined, therefore what you do on one side you have to do equally on the other, the information is not transferred. If the training was not conducted appropriately or evenly on an impressionable young horse or any horse for that matter, the personality is going to be effected differently on each side of the horse. The personalities can also be dictated by the health and emotional wellbeing of a horse. We have observed many horses that have appeared to be Yellow ‐ shutdown, aloof and reserved. These have often been horses used in racing or high level competition with insensitive owners. Once rehabilitated, health restored, authentic, consistent communication established they transform into confident, joyful, playful Blues.